Find out how to prevent Safari and Chrome on iPhone, iPad and iPod Touch from being redirected to mobfree.click site that pushes unwanted app downloads. The ongoing fuss around the issue of redirects to mobfree.click web page has been pinned to the most popular discussion boards for the users of Apple’s products. This problem is currently isolated to devices running iOS 9 and higher, affecting iPhones, iPads and iPod Touch gadgets. The infected customers experience web browsing issues when using Safari as well as Google Chrome edition compatible with the mobile platform in question. While surfing the web, users get repeatedly rerouted to mobfree.click site. Originally, those suffering from these occurrences would assume this was a website-specific issue as they were stumbling into the diverting when on Walmart.com, Consequenceofsound.net and a few more resources. The workflow of the compromise is fairly trivial. Let’s say an iPhone user goes online via Safari and navigates to an arbitrary page. Once the site of interest loads, the Internet traffic streams over to mobfree.click all of a sudden. 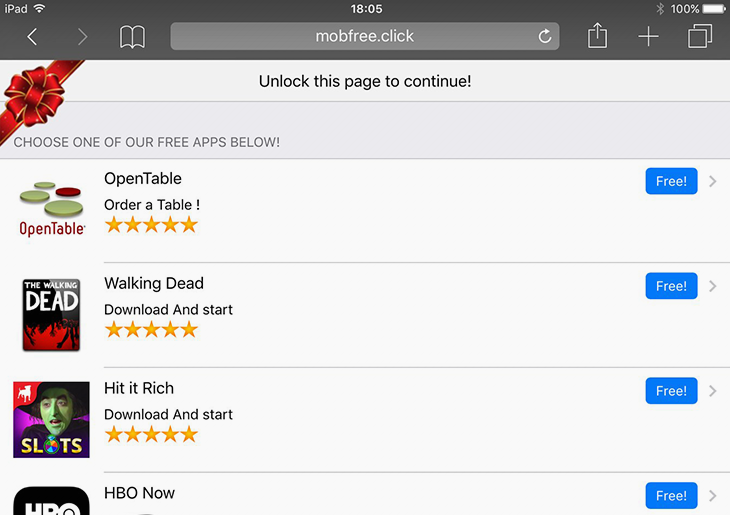 Mobfree.click, in its turn, displays a number of free apps and suggests that the user choose one. Furthermore, the bottom part of the screen says “Waiting for app download”, which indicates that some software may be installed in the background. It’s quite possible that the forcible setup may result in a more severe malware attack or an influx of junk entities that cram up the iOS device’s memory. • As the menu expands, make sure the following options are checked: Clear browsing history, Clear cache and Clear cookies. Confirm before exiting. The mobfree.click redirect activity should now stop in Chrome. Infections like mobfree.click on iPhone or iPad can infiltrate a device through unprotected connections. Logging into public Wi-Fi networks and visiting compromised sites may get the gadget exposed to malware and hacker attacks. It’s therefore strongly recommended to use automatic protection during web surfing.